4-Band antennas cover 40, 20, 10, and 6 meters, with no tuner required! 12 meters may also work on the 4-Band 300 watt model. The 4-Band antennas are OCF (off-center-fed), with a 23 foot leg and a 45 foot leg, totaling 68 feet. No tuner or counterpoise required, uses just one wire! Quickly switch bands and eliminate a tuner as one more thing to adjust or transport. Eliminate send/receive tuner loss. Short wave listeners will love this antenna because of its low noise reception. 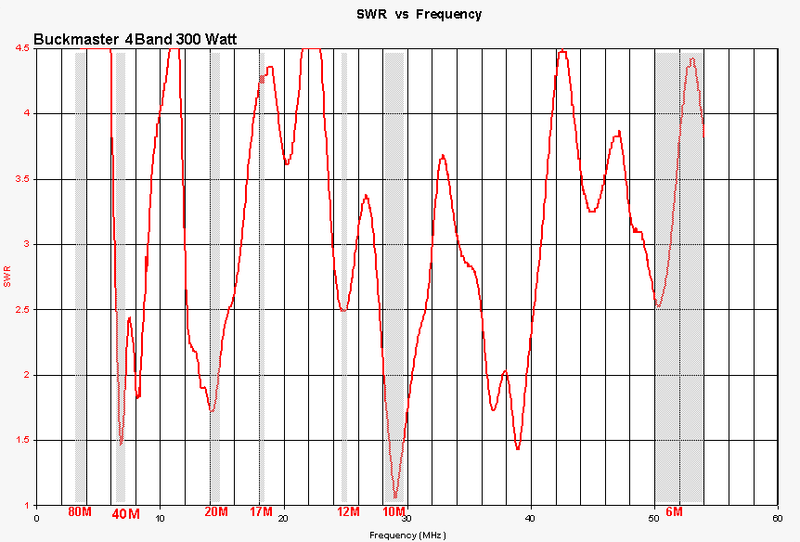 Check the SWR always BEFORE using with any antenna tuner (we don’t recommend an antenna tuner). It only takes overheating the Ferrite in the balun one time to change its characteristics. The dipole is constructed using top quality, flexible, tinned, 12 gauge, 65 strand, PVC coated copper wire pictured below. **The 7-Band 100 Watt antenna uses 14 gauge 38 strand wire of similar quality. 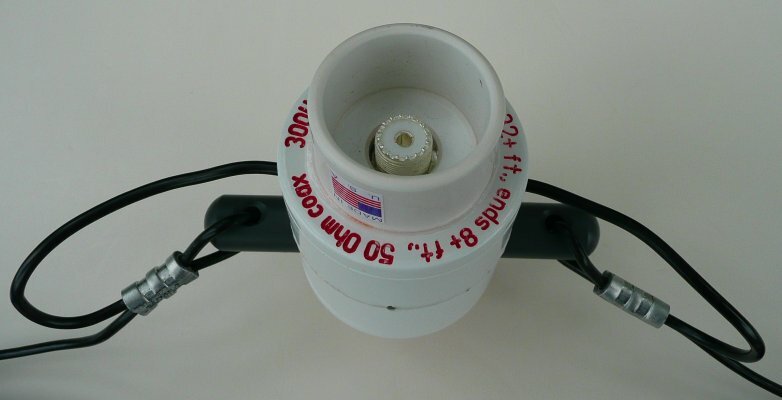 No trimming – fully assembled, complete and ready to go with end insulators and crimped center and end connections. Add your 50 Ohm coaxial feed line, suspension rope (see our OCF Antenna Support Rope) and go. No external hardware to loosen or corrode. Bands, power, height and other identification are clearly and permanently engraved on the exterior of the center insulator. Operation outside those bands are at your own risk and can likely overheat the balun! We inscribe the antenna with the bands and maximum wattage (in any mode) it can handle. Problems of RF on the exterior (common-mode feed line currents) of the coaxial feed line have not been experienced and are seldom reported with this antenna. RF problems are generally due to coupling to house wiring, guy wires, downspouts, etc. Any resonant length of metal can rob signal from any antenna by coupling to it, so study your environment and keep the antenna away from anything metallic. The balun also functions to reduce noise received on the outside of the coax feed line from making its way to the antenna (and your receiver) so you can better hear weak signals. The 300 to 50 Ohm (6:1) balun (also sometimes called an auto-transformer), is sealed in permanent black epoxy potting compound for moisture and corrosion free operation and is internally crimped and hard soldered to a beryllium copper silvered pin, Teflon barrel, SO-239 coaxial connector. Your PL-259 and coax go here (see photo below). Heavy duty stainless 1/4 inch center threaded, cemented with lock nut eyebolt supports the off center insulator for years of trouble free service. The off center insulator has a special drip collar to protect the SO-239 coaxial connector, yet lets moisture evaporate. Complete with permanently sealed white PVC off center weatherproof insulator containing the potted balun and crimped on gray end insulators. Suspension rope and coaxial feed line not included, see our OCF Antenna Support Rope, Stainless Steel Pulleys, and Line Grips. Installation Instruction Sheet: Word DOC Adobe PDF. These are the instructions that ship with the antennas. Usually works best as an “inverted-V.” Erecting at least 30 feet above ground is recommended. Each end can droop up to 30 degrees from horizontal, 180-(2*30)=120 degrees total is ideal, but anything from 120 to 180 degrees should work well. Ends should be 8 feet or more from the ground for safety reasons. Small lot? With the legs at a 120 degree angle as viewed from the side and depending on how you secure the ends, the 4-Band antennas need at least 60 feet of ground space from end-to-end. The 7-Band antennas need at least 120 feet of ground space end-to-end. 8-Band antennas need 239 feed of ground space end-to-end. If you don’t have anything to hang the center from, consider using a ‘messenger line’ between two supports (trees, etc.) consisting of a run of good quality, UV protected rope with a pulley at one support. Tie the OCF balun along this line in a spot that works for you (and will allow the balun to be reached from the ground) and run the coax away at a ninety degree angle (as possible). This takes tension off of the antenna legs and the pulley at one support makes it easy to take things down for service or inspection (be sure the rope is long enough). Also be sure to make allowances for support trees swaying in the wind by using a weighted gallon milk jug or two and a pulley to handle the movement of the tree supports. We recommend using rope and a pulley to hang the center balun, so the antenna can be easily lowered for access to connectors etc. Coupling to nearby metallic objects and the mineralization of the underlying soil can impact performance and impedance of an OCF antenna system. The impedance can also vary as antenna orientation is changed in relationship to earth. The OCF is generally very forgiving. The balun will test as a short when testing using a DC Ohm meter and will test correctly at RF frequencies when erected and using an antenna analyzer. So use an analyzer or your transceiver’s SWR meter at reduced power. 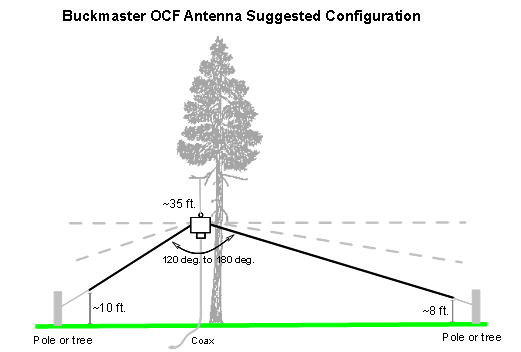 Route coaxial feed line to the shack by running it down to the ground (not tied to a metallic structure or tower) and away from the antenna at a 90 degree angle as possible. The length of the feed line is not critical as the coax is NOT part of the radiating antenna. Shorter is usually better. Use good quality 50 Ohm coaxial cable with appropriate power rating such as: RG58, RG8X, RG8, RG213, Belden 9913F7, Davis RF Bury-Flex. A coax with a dense (or double) braid is worth the money. Don’t lose that weak signal in the coax! Verify your coax and connectors (switches, etc) by temporarily installing a 50 Ohm dummy load instead of the OCF and checking SWR from the transceiver end. ALWAYS physically disconnect the OCF coax from equipment and securely ground both conductors when you are finished operating. Better to lose an antenna to lightning rather than a transceiver!